AfroPop: The Ultimate Cultural Exchange, partnered with the National Black Programming Consortium (NBPC) is back again for another chance to inform and educate the public with insightful and in depth renderings that aim to celebrate the present day Africa Diaspora. Viewers will be treated to host and actor Anthony Mackie who has been tapped to lead the series, which kicks off on Monday, January 13. 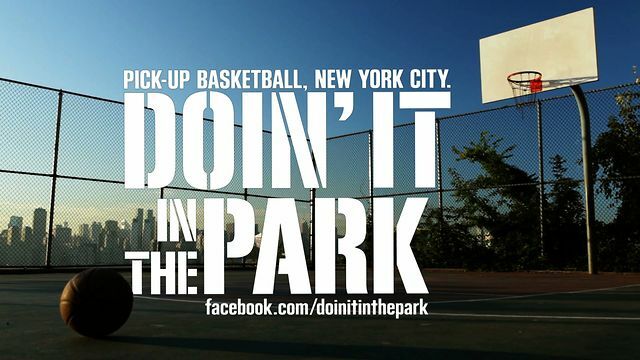 Doin’ It in the Park: Pick-Up Basketball, NYC, the award-winning film directed by Bobbito Garcia, a NYC based DJ and Kevin Couliau from France is a labor of love for both men who have a demonstrated passion for pick-up basketball. Couliau, whose background is in photography, has made a career out of capturing this particular evolving subculture of outdoor sports that has managed to captivate the attention of enthusiasts all over the world. This documentary will expose the specific methods employed in 180 courts throughout New York City, with sprinkles of testimonies from NBA athletes and die-hard players both past and present. The Latino Public Broadcasting is co-presenting, and judging by the recognition the film has received, including the Audience Award for Best Feature 2012 Urbanworld Film Festival, this should prove to be another authentically crafted piece that will surely induce progressive dialogue and inclined fascination. We caught up with the directing duo to extract more information on their latest project. MTB: How did you conceive the idea to explore the neighborhood basketball scene in New York City? Bobbito: I’ve played in NYC my entire life. Amazingly, no filmmaker had ever done a documentary about the pick-up scene! So Kevin and I wanted to fill a void and provide as honest a portrait as we could document. Kevin : As a frenchman juggling between Skateboarding & basketball, I’ve always been influenced by New York City. So I started documenting NYC’s playground scene in 2004, shooting stills all around town but I did my breakthrough in 2009 when I shot “Heart & Soul of New York City“, a short playground/hip hop clip for rap artists Red Café & Pete Rock. I secretly dreamed about doing a documentary about NYC’s basketball for severals years and Bobbito reached out to me early 2010 to collabore on a project about the game of 21, that ended up being “pick-up basketball” in a wider perspective. MTB: How has this infectious movement helped to define the thematic antics of the city’s thriving boroughs? Bobbito: Define? Basketball is New York. All boroughs. #1 sport and major influence on hip hop fashion (especially sneakers). It is also plays the role of sanctuary, and has kept many off the street from doing potentially harmful and negative actions. Kevin : Overseas, we all look up at NYC as a subculture reference, wether it’s music, lifestyle or sport. There’s no other city in the world where basketball takes so much space in the urban landscape, with such effort to preserve recreation areas. Each borough has its own hall of fame & pride, internationally recognized for some of them. Places like Rucker, West 4th and even Soul in The Hole are now becoming touristic stops, people from all around the globe get exposed to every components of the culture. MTB: Can you give us a brief summary of your backgrounds in filmmaking? MTB: What is the underlining message you hope to share with your audience? Bobbito: Play ball! Engage in free recreation for all the benefit that has for the community.